NATO’s push to reinforce the resilience and sovereignty of Ukraine and Georgia could provide an opportunity for a joint military engagement of the secondary partners – Armenia and Azerbaijan. Adopting the strategy of deterrence and dialogue vis-a-vis Russia at the Warsaw Summit, the North-Atlantic Treaty Organization (NATO) simultaneously came up with an extended assistance initiative for Ukraine and Georgia – the westward looking partners that have been the most afflicted by Moscow’s destructive posture. The Alliance has stepped up efforts to enhance the military capabilities of these aspirants both to meet NATO criteria, as well as to bolster their defensibility and operative readiness, aimed at making potential aggression appear too costly to be worthwhile. NATO’s push to reinforce the resilience and sovereignty of Ukraine and Georgia could potentially provide an opportunity for a joint military engagement of the secondary partners – Armenia and Azerbaijan. Its quest to forge an integrated force featuring both allies and partners that will operate coherently is likely to encourage Yerevan to set the stage for security cooperation with Tbilisi, as a measure to underpin Armenia’s sovereignty. Yerevan may be particularly influenced by the Enhanced Opportunities (EO) partnership, which was offered to Georgia within the framework of NATO’s Partnership Interoperability Initiative (IPI), what amplifies its politico-military value for the Alliance. In addition, Tbilisi’s increasingly functional role for NATO in the Black Sea could give fresh impetus to Yerevan to diversify its security priorities and rebalance its over-dependence on Russia through the fostering of credible strategic ties with Georgia. Almost simultaneously Levan Izoria and Vigen Sargsyan recently headed the Defence Ministries of Georgia and Armenia correspondingly. Both are obviously determined to deepen the partnership with NATO meanwhile opting for fostering a new paradigm of bilateral politico-military cooperation between Tbilisi and Yerevan. After initially admitting a range of new projects at the Wales Summit in 2014, the NATO-Georgia framework has since been transformed into a more inclusive and wider relationship, wherein Georgia has been embedded into the common activities that are designed for both NATO members and partners. Moving forward, the Warsaw Summit opened an avenue to position Georgia as somewhat of a platform aimed at facilitating other regional partnerships, e.g. by enabling Armenia and Azerbaijan to ramp-up their interactions with NATO via existing up-and-running facilities. 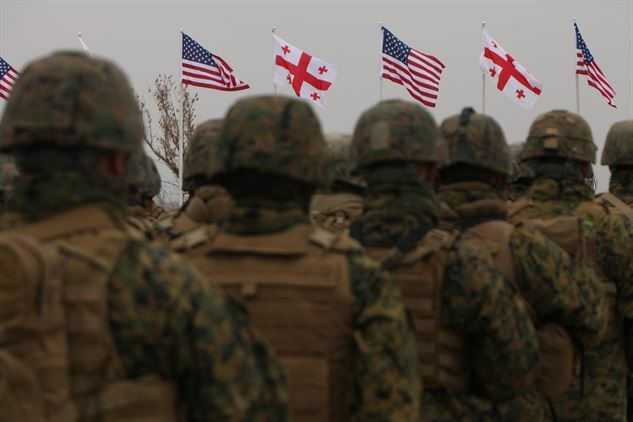 To date, the most valuable mechanism for Georgia endorsed by the Alliance has been the Substantial NATO-Georgia Package (SNGP), which is a set of multiple practical instruments that seek to reinforce Georgia’s defence capacities and enhance its interoperability with NATO members. In order to achieve these aims though training and exercises, as well as advice and liaisons, the Alliance designed and inaugurated the NATO-Georgia Joint Training and Evaluation Center (JTEC) at the Krtsanisi military base in August 2015 as a key element of the SNGP. Furthermore, the Defence Capacity Building Initiative format, coupled with the recently inaugurated Defence Institution Building School (DIBS), constitutes a cornerstone of NATO’s notable support of Georgian defensibility. Most importantly, Georgian units have been increasingly involved in the NATO Response Force in the framework of NATO’s common security challenges, as well as the nine US-sponsored drills in which Georgian troops annually participate. Regional cooperation and collective security building among NATO partners in various regions have invariably been of paramount importance for the Alliance. In this regard, the new military and political tendencies in the wider region will likely embolden the Alliance to contribute to the efforts of Armenia and Azerbaijan to develop robust defence ties with Georgia. Another argument that has made defence cooperation with Armenia appealing to Georgia is its intention, on the one hand, to mitigate the challenge posed by Russia on the Armenian side by facilitating the resumption of integration between Armenia and the West. At the same time, Tbilisi is presently developing security ties with Turkey and Azerbaijan in a trilateral format, based on the trilateral Trabzon Declaration in 2010. To supplement this achievement in its defence policy, Tbilisi nevertheless would prefer to balance the growing influence of the Turkish-Azerbaijani tandem on Georgian policy-making by reinvigorating its engagement with Armenia. Even though Armenia and Georgia effectively develop economic and people-to-people relations, Georgia’s former Defence Minister, Tinatin Khidasheli, earlier in 2016 made clear that the both countries lack strategic ties, given their starkly different security outlook. Armenian-Georgian relations have been characterised as “traditional”, which, in diplomatic wording, often means deficient and incomplete in terms of various spheres of cooperation. On the other hand, prior to the Warsaw Summit, Tinatin Khidasheli, during an official meeting with her Azerbaijani counterpart in May 2016, invited Azerbaijan to attend the next NATO multinational drills labelled Noble Partner, which are scheduled for 2017. Likewise, it is reported that Georgia and Azerbaijan will begin to engage in consultations aimed at revealing shared interests and mechanisms to cooperate in energy communications and infrastructure provision by the end of 2016. In contrast to the dynamics of its strategic relations with NATO member Turkey and non-block Azerbaijan, Georgia has been cautious about engaging with Armenia in the context of security and defence. The mounting standoff between NATO and Russia will continue to amplify the strain in Armenian-Georgian political relations unless certain steps are taken to prevent prospective entanglements and to establish a nascent track of credible cooperation. No wonder that the main hindrance constraints Armenia and Georgia to be drawn into profound defence relationship is Armenia’s membership in Russia-orchestrated Collective Security Treaty Organisation (CSTO). However, Armenia is the only country from SCTO that succeeded foster sustained and structural relationship with NATO. Armenia engaged in Partnership for Peace (PfP) framework and has developed the four stages of the Individual Partnership Action Plan (IPAP) since 2004. However, following the Russian-Georgian conflict in 2008, Yerevan and Tbilisi are formally divided in assessment and recognition of mutual threats that might spur deep security cooperation between the nations. Particularly, while Russia is the main source of risk and threat to Georgia’s territorial integrity and sovereignty, from the Armenian perspective, Moscow is seen as full-fledged ally. Significantly, the Russian 102nd military base, combined with Moscow’s increasing military-political influence upon Armenia’s policy-making as whole, poses key rationale for the NATO countries’ uncertain stance on pursuing strong security relations with Armenia. In the eyes of many of the allies, as well as Georgia and Ukraine, Armenia is viewed as somewhat unreliable from the strategic relationships standpoint due to a logical concern over the potential ability of Russia to interfere in Armenian politics. The reason why Tbilisi is uneven, and in some senses, reluctant about seeking defence cooperation with Armenia within the framework of NATO initiatives in Georgia is the subservient stance of the Armenian authorities vis-à-vis the Putin administration’s plans in the region. Armenian president Serzh Sargsyan, as well as his foreign and defence ministers, have attended the latest NATO Summits and have given assurances that Armenia is committed to contributing “Resolute Support” for Afghanistan. However, the cementing synergy between Moscow’s coercive diplomacy and the profound confusion of Armenia’s foreign policy made Armenia purposeless to serve its core national interests turning the state increasingly vulnerable in the relations with Russia. There is another unpleasant factor eroding the prospect of Armenian-Georgian strategic engagement under the auspices of NATO. It is Kremlin’s consistent efforts to boost its military prowess by entrenching and reinforcing its strategic presence in Armenia. A case in point is the initiative to establish joint Armenian-Russian air defence and land force units, that potentially may deteriorate the almost “frozen” Armenian ties with NATO and Georgia – not to mention that it might exacerbate the political situation around Armenia. The Russian playbook on Armenia is straightforward: to limit and then paralyse over a long-term period of time the Armenian MoDs independent policy-making capacities and drag the country into its military-political confrontation with the West. Yerevan and Tbilisi have sometimes demonstrated cooperation in their military education, and periodically, a small number of Armenian servicemen have continued to visit Georgia’s training facilities. Such moves, however, have almost nothing to do with the NATO infrastructure in Georgia, notwithstanding the fact that the MoD’s of both Armenia and Georgia occasionally host official visits. The states annually define the arrangement for their defence teamwork, but the results seem to be fairly modest and inert. Nonetheless, this may lay the groundwork for the conceptualisation of a common security agenda in the future. It is not surprising that much of Armenia's legislation has been copied from analogous Soviet-era and Russian documents that have proven to be obsolete and irrelevant in addressing modern challenges. Therefore, more and more Armenian high and mid-ranking officers have been aspiring to Western standards at the expense of CSTO and the Russian military framework. Furthermore, with respect to the political aspects of such a dilemma, at the threshold of a new wave of escalation with Azerbaijan in April 2016, and more significantly, in its aftermath, Armenia experienced the increasing unreliability of CSTO. In fact, all five of Yerevan’s allies have neglected or explicitly acted against Armenia’s national interests. This reality, in turn, has only underscored the pro-NATO mood and the endorsement of Armenian-Georgian teamwork among the armed forces. The simultaneous co-existence of NATO standards and the Soviet/Russian framework in the military and security spheres, especially in military-political planning, has caused systemic incompatibilities, and hence, has impeded reforms in Armenia. This problem has been coupled with the oversized bureaucratic decision-making process that is common to many authoritarian countries. Therefore, the resumption of integration through involvement in additional partnership frameworks with NATO appears to be crucial for Armenia’s security and defence capacity building. Primarily, Yerevan and Tbilisi in order to neutralise the potential threats and mistrust stemming from Russia’s consistent buildup in South Caucasus should come to an agreement about their bilateral neutral stance once one of the states obviously or indirectly are involved in conflict with a third party. This accord appears of paramount importance as it might be a bedrock of further strategic rapprochement. Above all, such an agreement should contain reassuring elements that to commit both states to refraining from activities that could potentially affect each other’s security and defence. This obligation would dispel the speculation that Armenia has irrevocably become a tool for Russia’s anti-Western strategies and would derail some of the Russian plans to put pressure on both Armenia and Georgia. The second step to enhance their ability to work together is the establishment of the Armenia - Georgia Operative Centre, which was designed to unveil and assess areas of common threats and interests. First and foremost, the core task of the Centre would be to implement joint elaboration of the Concept of Common Threats. This would come as a substantial step forward for Armenia’s further attendance at the activities designed by the Alliance in the Georgian soil. In the following stage of cooperation, the joint liaison centre and relevant infrastructure are required to facilitate the interoperability of troops those of Georgia, NATO partners and Armenia to conduct joint activity. These points are reasonable to deploy on the former permanent dislocation site of the 62nd Russian military base at Akhalkalaki town of Samtzkhe-Javakheti province. While the base has been removed from Georgia in 2004-2007, its entire infrastructure - albeit obsolete- remains so far. This Georgian province is mostly populated by ethnic Armenians and therefore has long been a latent destabilising factor in Moscow’s hands as a potential “separatist” hotspot against Tbilisi. Thereby, the emergence of joint Armenian-Georgian assets as part of SNGP framework would mitigate Russia’s potential aim to use the sentiments of local Armenian populous as hybrid warfare element against Tbilisi. There can be no doubt that in response to Yerevan’s attempts to rectify the rupture in Western integration via prudent choices to be established with Georgia, Moscow would manage to thwart Armenia’s option to drift westwards. However, it is up to Armenian authorities to point out to Moscow that the security engagement with Georgia does not seek power projection at the expense of Russia’s interests even though it implies sustained security inter-action between Tbilisi and Yerevan. To the contrary, given the transparent nature of such initiatives the engagement of Armenia and Azerbaijan with Georgia in security, training and defence planning will preserve stability and predictability of the region. *Eduard Abrahamyan, is a Doctoral Researcher at the University of Leicester, UK. His expertise is on NATO’s strategy evolution and adaptation in the Eastern Europe and Black Sea regions. The extended report of this text is in production for Armenian Institute of International & Security Affairs. Photo Credit: Marforeur - Marines assigned to the Black Sea Rotational Force observe the national anthems of the United States of America and Georgia during the opening ceremony of Operation Agile Spirit on Vaziani Training Area in Georgia, March 12 2012.